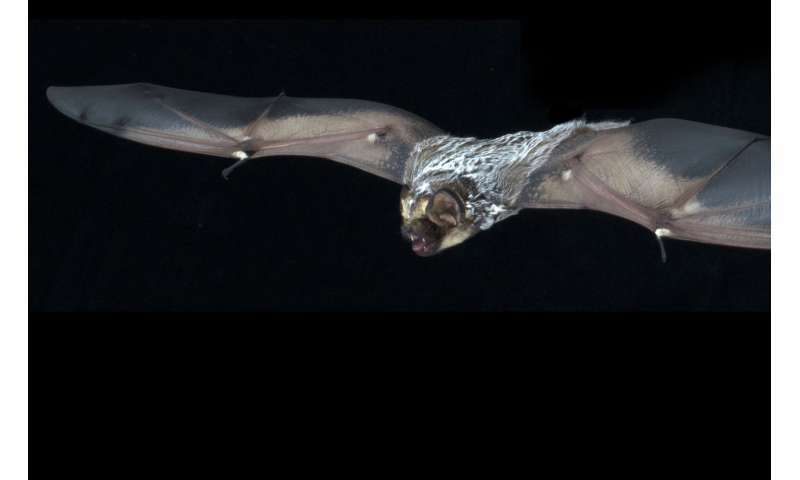 "We provide strong evidence that, under some conditions, hoary bats—the most widespread bat species in North America—fly without producing detectable echolocation calls," said Corcoran, lead author of the study. "These findings challenge our current understanding of how bats sense the world around them." Using specialized infrared cameras and ultrasonic microphones to record bats flying through river corridors in northern California, the researchers discovered that bats use short, extremely quiet "micro-calls." At times, no echolocation calls at all were detected, even from bats flying within 10 feet of the highly sensitive audio recorders. The researchers suspect turning down or turning off their sonar is part of the bats' mating behavior and is intended to make the bats less conspicuous to competing bats and potential mates. "We speculate that bats are going quiet to prevent other bats from eavesdropping on them during the mating season," said Corcoran, noting that such behavior hasn't been documented in hoary bats outside of their fall mating season. To test whether bats had compromised navigational abilities, the researchers stretched a mist net across their natural flight corridor. The researchers found that at first the bats either used micro calls or no calls at all. For the bats that flew into the net, only micro calls or no calls were detected on the initial approach. The bats did begin producing normal echolocation calls within several feet of the net - too late to avoid collision. "Determining the situations in which hoary bats reduce echolocation and which other species may also be exhibiting this behavior will be important for informing how best to monitor bats at wind energy facilities and protect them from collisions with turbines" Weller said. Corcoran and Weller have configured miniature bat "backpacks" with an audio recorder and tracking device to find out more about when and where they use echolocation, or not. "We hope this next round of research will shed even more light into our understanding of the sensory ecology of bats and what might be causing their fatal run-ins with wind turbines," Weller said.